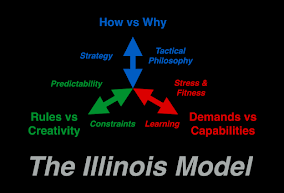 Over the course of the next few weeks, I will be re-engineering Police Incident Command according to The Illinois Model . Most of the ideas aren't earth-shattering, but they suggest some small adjustments to the nationally-mandated program. These first several posts lay some foundation into our vision of what IC should be. Click on the Incident Command label for all posts in this short series. This is Part One. Public safety emergency response sometimes looks like an athletic contest; other times it looks like a boardgame. Incident commanders, tactical/strategic commanders, line-level supervisors, and responders must all understand how leadership and management factor into these two different operational environments. 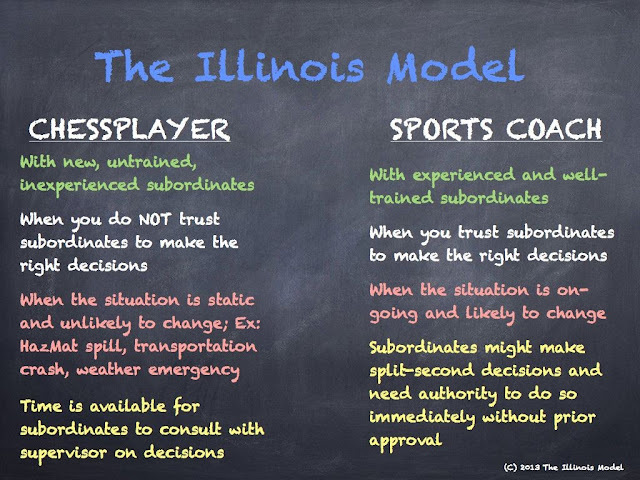 The analogy of the sports coach versus the chessplayer can be a powerful beginning to a more effective police response. How aggressive/conservative will the offense be? How aggressive/conservative will be the defense be? How can the team keep or regain momentum? Is it time to stall and regain composure? What players are best suited for this opponent? Coaches understand that trained and practiced athletes are allowed to make immediate decisions in a rapidly changing, dynamic environment. They rely upon hours and hours of practice and their coaches' guidance to control their actions in the game. Coaches make adjustments to these strategic decisions from the sidelines, but only when the situation requires and permits such. Between these corrections, coaches allow their players to play. At game time, coaches are leaders. Chessplayers operate in a different environment. The biggest discrepancy is the lack of trust in and autonomy of the "pieces." Pieces on a chess board cannot think or act for themselves; they must be moved around by their player. But another difference between sports and chess is the pace of the game. Chess is static. There is time to evaluate and ponder each and every move. The status of the contest is very known - anyone who sees the chessboard can see what the situation is. The chessplayer controls all of his/her team's strategy, tactics, and movements. The chess pieces' lack of training and ability mandates that someone else make the decisions. The slow static pace also allows that to be the case. Chessplayers are managers; good ones are also leaders. Police response runs the spectrum from fast-paced dynamic actions to slow and static deliberations. The threats and dangers are what dictate the necessary speed of the officers (speed is synonymous with: intrusion, aggression, or force). 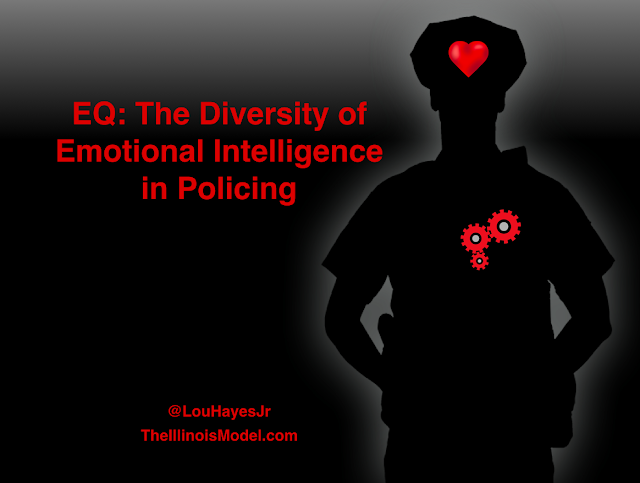 Police options run along a spectrum of strategies, bookended by The Illinois Model's Act and Stabilize. Officers must mirror their strategy/speed to that of the urgency of the situation's threat level. Incident Commanders (IC) must also match their style of supervision to the situation. In fast-paced environments where officers must act, ICs have only enough influence on the goals and strategies...much like a sports coach in the middle of developing plays on the field. They can lead, but they cannot manage. But in other situations where officers slow down and stabilize, ICs have the luxury to seize more control and exercise a higher degree of accountability. In these cases, Incident Commanders can both lead and manage. Stabilize (Chess) versus Act (Sports). As police situations change from dynamic-to-static or static-to-dynamic, so must the officers....and so must the supervision style of the IC. This ideal of Police Incident Command is not fantasy. It is not a pipe dream. It is a reality. But not everywhere. It only exists inside agencies where Incident Commanders, tactical/strategic commanders, line-level supervisors, and responders have had fruitful and honest discussions about tactical ethics, lawfulness of police actions, and strategic options. 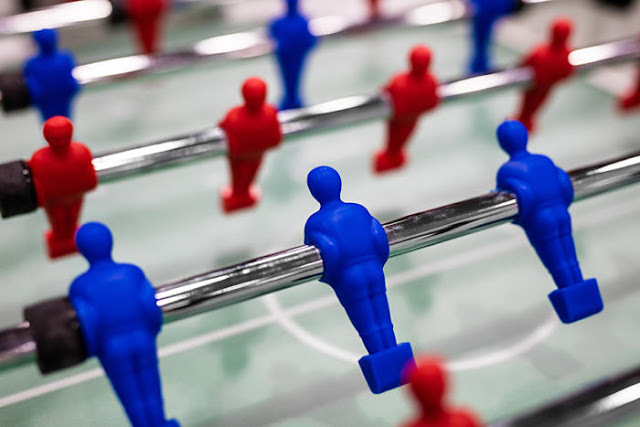 These discussions are followed up with tabletop exercises, then realistic field drills. This progression of education, training, and practice is what solidifies the trust and abilities of the players in the field. It builds a confidence so ICs can properly spend their energy and influence...as leaders....and when possible, as mangers. Sometimes officers must be treated as pawns on the chessboard. Sometimes as athletes who interact on a playing field. Sometimes the situation lays in between. Striking the right balance at the right time is what makes great coaches, great chessplayers, and great cops! 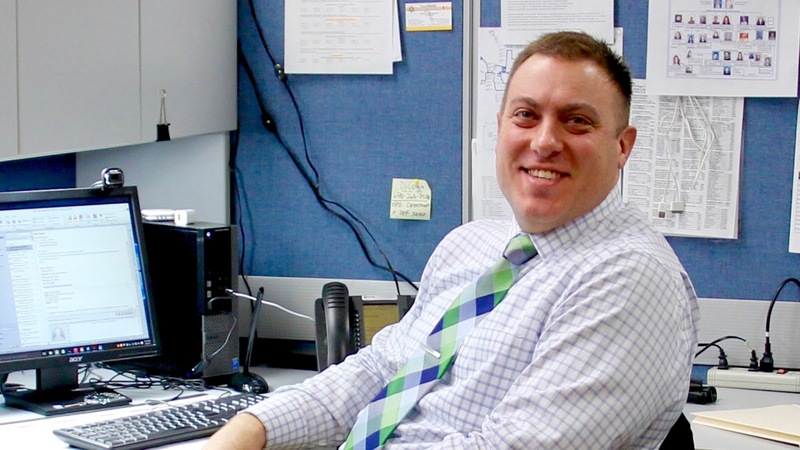 Lou Hayes, Jr. is a criminal investigations & intelligence unit supervisor in a suburban Chicago police department. With a passion for training, he studies human performance & decision-making, creativity, emotional intelligence, and adaptability. Follow Lou on Twitter at @LouHayesJr or on LinkedIn. He also maintains a LinkedIn page for The Illinois Model. Well said Lou! I would only add that chess players and athletes both have to learn the rules of the game(so to speak) before they become players. In ICS that means a day or so of invaluable classroom training on the fundamentals, and the why. A few videos of past incidents good and bad help enrich the discussions you refer to. It did not take long for me to put into practice the ICS training I had years ago. This is a great topic! One needn't look far to find an online video of some copper somewhere losing his temper. I'm about to enter my third decade of policing. In nearly twenty years on the force, I've let my emotions get the best of me more than a handful of times. I'm not talking about the tears of sadness after leaving the scene of a brutal crime, a deadly accident, a suicide, a failed family, or an abused kid. I'm referring to the instances where I unnecessarily responded to someone by taking the low road of sarcasm, intimidation, disrespect, insult, name calling, or attitude. Of those times I can recall, I look back on them with embarrassment. Simply, those were times that I lost. But what about ending the presentation? What tricks do I use to bring closure to a projected slide deck? 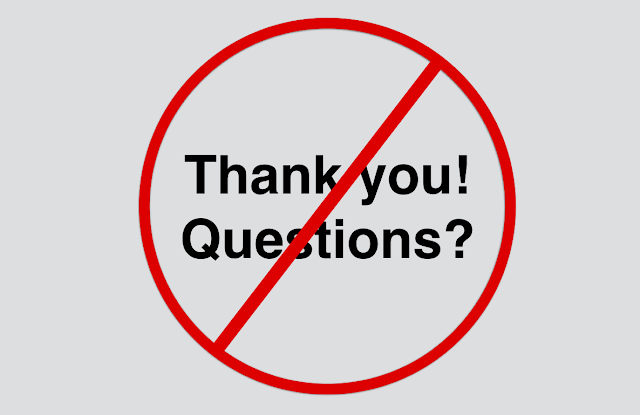 How do I handle a summary or a Question-and-Answer session? Everyone has a plan until they get punched in the mouth. - Mike Tyson, professional boxerI've been assigned to help plan what's officially called a Full Scale Exercise. Or as I like to call it: Red Teaming. eight (8) to ten (10) police departments;eight (8) to ten (10) fire / emergency medical (EMS) departments;dispatch / 911 center;& multiple hospitals. The BLUEteam is comprised of those who "respond" to the emergency. It's the cops, firefighters, paramedics, 911 operators, public works employees, nurses, emergency management, & other government officials. The RED team is comprised of role-players who operate at the direction of scenario controllers. They're the victims, witnesses, criminal/terrorist offenders, & innocent by-standers.